Please scroll to the bottom as we continue to populate our "Frequently Asked Questions" page during the referendum phase. Still have a question? Submit your question in the "Questions or Comments" section and if you leave an email address, we will get back to you. Q. What's the timeline on completing the LRMP? A. The Long Range Master Plan (LRMP) timeline is described on the Timeline and Milestones webpage. The timeline started nearly three years ago (2015) and will culminate with a community wide survey this spring (2018) that the School Board will use to formalize a LRMP this summer (2018). This Plan will identify curriculum, programming and facility improvements with a prioritized approach to accommodate the district's needs for the next 10 - 15 years as needs arise. Q. When did the LRMP process start? A. The Long Range Master Plan started back in October of 2015 with the annual facilities update to the Board. Once complete the LRMP will be revisited annually. The LRMP provides current and future School Boards a roadmap on how the district will maintain a trajectory of success for future years. Q. What are the greatest academic needs for Cedarburg School District (or at each school)? A. The greatest need that has surfaced through focus group presentations is the need to target technology and engineering education (science, technology, engineering, art and mathematics or STEAM). It was also identified that the STEAM curriculum should be initiated in the primary grades with a congruent set of curricula through elementary, to middle school and through the high school. Other needs that are consistent across the district include contemporary learning spaces that allow for flexibility in learning and instruction, small and large group spaces for instruction, collaboration and active learning. Many comments were also made to maintain the very high level of outcomes the district has come to be known for while simultaneously focusing on those students interested in the workforce or Tech. schools. Q. With our elementary schools currently experiencing capacity issues, why not eliminate 4-year-old kindergarten to free up extra space? Access: Prior to the District’s implementation of 4K, not all students had access to 4K. Whether it be transportation limitations, enrollment costs, or for any other reason, 4K programming was not accessible to some families. Now, 4K families all have access to a guaranteed learning opportunity at their home school location. Quality: Cedarburg School District teachers receive annual and ongoing professional development, ensuring their instruction is both developmentally appropriate and abounding with resources and tools to guide each lesson. Governed by school board policy, and state statute, students are afforded learning experiences that aligned to the district’s beliefs about learning and aligned to best practices for the content area(s) being taught. Coherence: Students are guaranteed a rich learning experience aligned to the district 5 year old kindergarten standards and district beliefs. Classroom instructional practices match and are scaffolded from one grade to the next. 4K classrooms are in each student’s home-school location and provides each student with an opportunity to get to know other students at their school, become familiar with school routines and become an integral part of the school learning community. Additional Information: The demands on capacity from a 4K program are not the same as other grades. Enrollment in 4K is typically 25 to 35 percent less than other elementary grades and 4K students only attend school half a day compared to other grade levels. Half Day attendance requires less resources than full day attendance. For example, 4K enrollment for the 2017-18 school year was 146 students. Since those students only attend Cedarburg half of the day, the District needs to allocate enough space for about 73 students. Spread out over three buildings, that would result in one to two classrooms being needed per building for the 4K program. When the District looks at long range projections for enrollment, freeing up one to two classrooms would not be sufficient to account for the predicted growth; additional space would still be needed. Q. What curriculum is being evaluated? A. Current content areas being evaluated include, K-5 Social Studies, K-2 Literacy, K-5 Math, K-5 Science (Engineering in particular), 6-8 Science, 9-12 English, and the district has initiated conversations around 9-12 tech. ed./engineering/advanced manufacturing. Additional courses in coding, healthcare, engineering, and orchestra are being explored. All course work is on a regular evaluation cycle to ensure that all current standards and expectations are being addressed. Q. How have the schools been maintained over the years? A. Each school has been maintained very well. Through 20+ focus groups, the one consistent theme shared by all, was the fact that although our facilities are all 50 years old, they have been impeccably maintained. For the past 20 years, our school board has been committed to procuring funds to keep our buildings and grounds in top operating condition. Our purpose is to provide all occupants with a clean, sanitary, comfortable environment in which to learn, work and enjoy. Q. 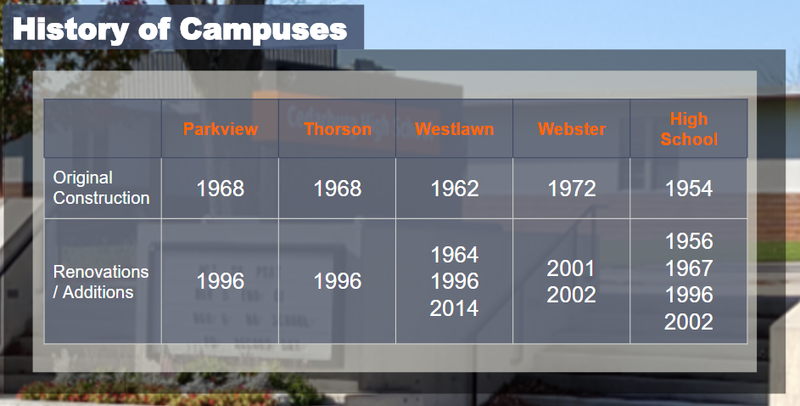 When is the last time renovations/additions were made at CSD schools? A. The last significant additions and renovation were completed in 2002. There have been some smaller upgrades since that time done within the annual operational budget. The district does plan to upgrade the heating and cooling systems this coming summer (2018) at Thorson and Parkview Elementary Schools and the boilers at the high school and Webster. Past School Boards have been strategic in planning for renovations that are focused on student needs. This image shows the original construction dates as well as enhancements over time. Q. Is security and safety being reviewed during this process? A. Yes, safety and security inside and outside the buildings will be assessed as part of the LRMP and is a high priority. Externally we will be identifying school traffic patterns both during the day and drop off/pick up times. We are working with the Cedarburg Police Department and the Cedarburg Fire Department to assess safety and security needs. Parking lot capacity and safety will also be assessed. Internally, we will continue evaluating any technology that will provide us with enhanced security for our students, staff and public. Q. How does enrollment impact the tax levy? A. That is a complicated question, but generally, when enrollment increases, the District gets more aid from the State for those students. If more teachers are not needed due to this growth or in other words the new students can fit within a class that is not overcrowded, this increases our revenue from the State but does not significantly increase our costs. This example is just one scenario but there are other factors that ultimately affect the final local tax levy each year. Enrollment is an important factor when it comes to public school finance and it impacts many different areas of the budget including the tax levy. All public school districts work within a revenue limit which caps the amount of money they are able to collect from state aid and taxes each year. As enrollment increases, the revenue limit for a school district will also increase allowing the district to collect extra funding to educate the additional students. With the increase of the revenue limit, aid from the State increases as well to help offset the revenue limit leading to a flat tax levy impact. If property values are growing as a result of these additional students, as is typically the case when there is residential development, the tax levy rate could actually decrease since the tax levy is being spread out over a larger tax base. Q. What is our current levy and how do we compare to others? A. The 2017-18 property tax levy rate for the Cedarburg School District was set at $9.10. This is the second lowest rate in the County. The property tax levy rate of $9.10 in 2017-18 represents a decrease of 4.61% from the prior year and it is the fourth straight year that the levy rate has decreased for the District. Cedarburg has a property tax levy rate lower than Port Washington-Saukville ($10.37), Grafton ($11.27), and Northern Ozaukee ($10.06) and is only higher than Mequon-Thiensville which has a property tax levy rate of $8.07. Q. What is the history of the tax levy for the Cedarburg School District? A. The tax levy rate, or mill rate, is an estimate on how much a property owner will pay in taxes for the Cedarburg School District based on every $1,000 of property value. Over the years, the mill rate for the District has gone up and down due to many different factors with one of the most significant changes occurring in 1993 with the introduction of revenue limits which cap the amount of tax revenue a district can collect each year. Since 2013, the mill rate has declined each year for the Cedarburg School District and in 2017 the Board of Education certified a mill rate of $9.10 which is the third lowest rate in the District over the last 34 years. Please click the link for a full history of the mill rate since 1984. Q. Will we need to acquire new land? A. That could be identified as a recommended action as part of the LRMP. If this is a need, it would be driven by the assessment of current and future enrollment projections. The district currently owns 20 acres on Bridge Street in the Town of Cedarburg that could be identified for future school sue. Through the LRMP the question of additional land acquisition will be addressed. Q. How are we staying up-to-date with technology infrastructure? A. The School Board has approved annual budgets that have allowed for consistent upgrades to our technology infrastructure. Assessment and evaluation of our infrastructure is ongoing with a proactive position to anticipate and predict future needs. Q. How are workforce development needs being address as part of the LRMP? A. The LRMP is a comprehensive look at the current and future job prospects. The goal is to provide pre-workforce opportunities for all students who are interested in a particular field. Defining college and career pathways for all students will ensure students are exposed to content and opportunities of interest. Q. How can I receive more information on the LRMP? A. More information can always be found on the District Long-Range Planning webpage. Additional information can be obtained by contacting any of the district's administrators or by calling 262-376-6102. Q. With the reduction of the original project cost going from $72.3 million to $59.8 million, that represents a approximately 20% drop in expenses. With that reduction, the tax rate increase is reduced from a .98 cent increase for every $1,000 of home value to .58 cents per $1,000 of home value, over the prior tax year, which is a decrease of just over 40%. Why does when the project cost drop by 20% that the tax rate increase reduce by a higher percentage of 40%? A. By reducing the scope of the project, the District has reduced the increase on the tax levy from .98 cents to .58 cents, which is a reduction of just over 40% (40.82%). The reason these two percentages are different is mainly due to the fact that when we look at the tax increase variance, we are looking at just a portion of the total tax impact from the borrow since we are focusing on how much the tax levy would increase over current. If we look at the new borrow as a slice of the pie that makes up our total levy, you will see that it still drops by .40 cents from $1.81 to $1.41, but that the percentage drop (22.10%) is more in line with the percentage drop for the project (17.29%). By comparing these two numbers, it is more of an apples to apples comparison with property value changes being the main variance. When we compare the percentage reduction to the project to the reduction in the tax increase, we are only look at how that new rate would impact our current tax levy so having our current debt obligations fall off leads to the project reduction percentage not matching up with the changes to the tax increase. Q. Why has the district already hired contractors to do the work when the referendum hasn’t even passed? A. The District has not contracted with any firm to do any of the construction work in the proposed plan. No design beyond high-level concepts has been done. Because the District does not have professional design, budgeting or planning expertise in-house to consider options to address long-term facility needs, the Board decided in May 2017, to seek additional professional services. After a competitive bidding and qualification based process that included multiple firms, the Board approved hiring professional services firms to plan, design, budget and coordinate the project. Their proposals also included design and construction management (bidding management) services in the event that a referendum is passed. The Groth Design Group and CG Schmidt were the qualified low bidders for those services. No contracts for any construction work have been awarded, and no design beyond concepts has been done. All construction trade work will be competitively bid only if a referendum passes and after design is complete. The bidding process will follow the Board approved policy Purchasing 6320. Q. What portion of the total levy rate would this project represent? A. The estimated tax levy rate increase as part of this project would be 58 cents, which would represent an increase of about $58 for every $100,000 of home-value for a property owner compared to the 2017-18 tax levy year. This increase would bring the new estimated tax levy rate to $9.68 for 2019-20, assuming no other changes occurred to the levy. Of that $9.68, $1.41 would represent that portion going to referendum debt payments which includes the 58 cent increase. Q. What does the Cedarburg School District currently spend per student and how will that be impacted if the referendum were to pass? A. Based on the most recent data available from the Department of Public Instruction (DPI), the Cedarburg School District spent $11,860 per resident student in 2016-17. Compared to other area districts, this is one of the lowest rates in the North Shore. In addition, this rate is $1,322 less than the state average of $13,182 per student. If the referendum were to pass, it is estimated that the cost per student would increase by $500, which would still keep Cedarburg School District below the state average and at one of the lowest rates in the area. Q. How much will my tax bill increase increase if the referendum passes? A. The levy for the school district is just one of many factors that are part of the tax bill you receive each year. If the referendum were to pass, it is estimated that the portion of your tax bill going to the Cedarburg School District would increase over the current amount by $58 per every $100,000 of home value that you have. Q. How does open enrollment impact capacity in the District and does the District subsidize the open enrollment? A. The District only accepts open enrollment students into the system when there is space available and when the additional students would NOT lead to extra costs for the District. The transfer amount between districts for open enrollment students is $7,379 as of 2018-19. The District's cost per resident student each year is $11,860. To mitigate the difference in revenue generated versus expense, the District strategically places open enrollment students where space is available AND when NO additional expense will be incurred. Open enrollment students are spread throughout the District, on average there are only 1-2 OE students per class. If the District were to remove all open enrollment students from the system, the buildings would still be facing capacity issues since the number of class sections would not decrease. The percentage of open enrollment students in the system is at 6.23% as of the September 2018 membership count. This percentage is below the state average of 10.77%. Q. Historical data on student enrollment shows the District has declining student enrollment. Why does the District believe this trend will reverse? A. Our growth estimates are projecting between 120 and 250 new resident students being added to the system over the next 5-7 years. These short term estimates are based on an in-depth study using actual approved residential developments and case studies of specific developments and multi-unit buildings within the boundaries of the District. In addition, Applied Population Laboratory (APL), a third party research firm, conducted a study in 2017. ALP used five different methodologies in studying potential growth. The Residential Development Projection study uses residential development and trend data from the past three years. The study of our recent enrollment trends, shows the student enrollment trending upwards. Our resident student population for the 2018-19 shows an increase in our student population over the 2017-18 school year. This is the predictable increase expected based on the studies. The upswing in enrollment is a change from the trend over the last 15 years. The increase in residential development compelled the district to commission the APL study. Just analyzing enrollment trends was not sufficient given the fact that there is was increase in residential developments compared to 10 years ago. The resident student population increase for the 2018-19 school year, is the largest increase seen in 15 years. This increase aligns with the APL study and the District's study. For more information on the enrollment estimates and the case studies, please use this link. Q. Where can I see a break down of the $59M requested? I have seen the break down into 3 categories: Elementary, Middle, and High School. Is there a more detailed list of proposed expenditures available? A. The specific design work will occur only after the referendum passes. After the design work is done, a competitive bidding process will be used and each bid selected will be approved by the school board. It is at this time that we will have the exact costs on each space. The $59.8 is the budget for the proposed project. The drawings are at a conceptual stage and the costing was done using industry standards, which draws information from experts in the field as well as projects of similar scope and breadth.